The first year for Sammy’s Place to sponsor the annual event! Sammy’s Place first online fundraiser! The old saying is that it takes a village. We at Sammy’s Place are grateful that our “village” of support now reaches across the nation. With the help of 500 supporters, we not only reached our fundraising goal of $30,000, we surpassed it! While raising this money, we also put on a great celebration in Seaside. On September 19, 2015, young and old gathered together at Quatat Park in Seaside, OR to dance, celebrate and raise awareness. There was live music, dancing, face painting and a delicious, organic and gluten-free breakfast for all to enjoy. A sea of purple-shirted people spilled out onto the main street to promote inclusion and acceptance of people with Down syndrome. We celebrated people of all abilities, showing those who looked on that diversity is a gift for us all. 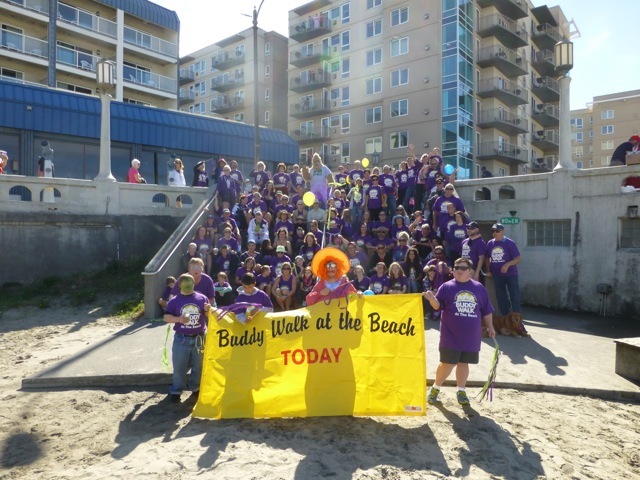 Like the many other Buddy Walk events across the nation, our walk raised money for the National Down Syndrome Society. However, most of the $38,000 (93%) that you helped us raise remains here locally. Your support is helping Sammy’s Place to establish a nature-centered living, working and respite community for people with intellectual disabilities here on the North Coast.